Cancer is the leading cause of death worldwide. Nanomaterials and nanotechnologies could provide potential solutions. 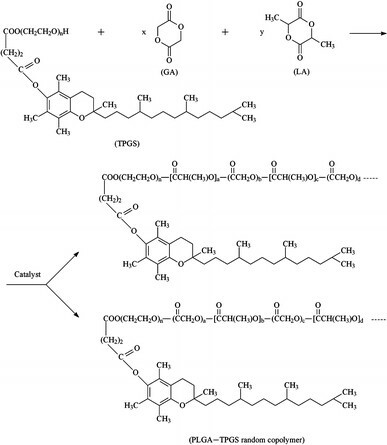 In this research, a novel biodegradable poly(lactide-co-glycolide)-d-a-tocopheryl polyethylene glycol 1000 succinate (PLGA-TPGS) random copolymer was synthesized from lactide, glycolide and d-a-tocopheryl polyethylene glycol 1000 succinate (TPGS) by ring-opening polymerization using stannous octoate as catalyst. The obtained random copolymers were characterized by 1H NMR, FTIR, GPC and TGA. The docetaxel-loaded nanoparticles made of PLGA-TPGS copolymer were prepared by a modified solvent extraction/evaporation method. The nanoparticles were then characterized by various state-of-the-art techniques. The results revealed that the size of PLGA-TPGS nanoparticles was around 250 nm. The docetaxel-loaded PLGA-TPGS nanoparticles could achieve much faster drug release in comparison with PLGA nanoparticles. In vitro cellular uptakes of such nanoparticles were investigated by CLSM, demonstrating the fluorescence PLGA-TPGS nanoparticles could be internalized by human cervix carcinoma cells (HeLa). The results also indicated that PLGA-TPGS-based nanoparticles were biocompatible, and the docetaxel-loaded PLGA-TPGS nanoparticles had significant cytotoxicity against Hela cells. The cytotoxicity against HeLa cells for PLGA-TPGS nanoparticles was in time- and concentration-dependent manner. In conclusion, PLGA-TPGS random copolymer could be acted as a novel and promising biocompatible polymeric matrix material applicable to nanoparticle-based drug delivery system for cancer chemotherapy. Cancer is the leading cause of death worldwide . Nanotechnology has the potential to have a revolutionary impact on cancer diagnosis and therapy. Drug delivery via nanoparticles presents novel therapeutic opportunities for drugs that were previously unsuited to traditional oral or injectable drug formulations, allowing drugs to be delivered efficaciously while minimizing side effects and leading to better patient compliance. Specifically, nanoparticle-based drug delivery systems have enormous potential in addressing the failures of traditional drugs that could not be effectively formulated due to factors such as poor water solubility or a lack of target specificity [1–3]. Synthetic biodegradable polymers have been widely utilized as the polymeric matrix materials of drug delivery systems. A few synthetic polymers, especially linear polyesters such as poly(ε-caprolactone) (PCL), polylactides (PLA) and poly(lactide-co-glycolide) (PLGA), which have been approved by FDA, are of great interest for medical applications . Among them, PLGA is one of the most widely used biodegradable polymers to make nanoparticles for controlled drug delivery systems [4, 5]. However, these polymers were originally synthesized to be used as surgical sutures, which therefore have disadvantages to be used for drug delivery systems such as too high hydrophobicity and too slow degradation . In addition, long-term incompatibility with blood cells and uptake by the reticuloendothelial system (RES) of PLGA nanoparticles as drug carrier are also a problem . One of the limiting factors in this field is their thrombogenic property. Thus, the surface modification of the nanoparticles with a blood compatible material is important in order to improve the potential of intravenously administered nanoparticles in the drug delivery systems. It has been demonstrated that methoxy poly(ethylene glycol) (mPEG)-modified nanoparticles provides protection against interaction with the blood components, which induce removal of the foreign particles from the blood . d-α-tocopheryl polyethylene glycol 1000 succinate (TPGS) is a water-soluble PEG derivative of natural-source vitamin E, which has amphiphilic structure comprising of hydrophilic polar head group (tocopherol succinate) and lipophilic alkyl tail (polyethylene glycol, PEG). Its bulky structure and large surface area make it become an excellent solubilizer, emulsifier, bioavailability enhancer of hydrophobic drugs [6, 8, 9]. Furthermore, TPGS could improve drug permeability through cell membranes by inhibiting P-glycoprotein (permeability glycoprotein, abbreviated as P-gp), thus enhancing absorption of drugs and reducing P-gp–mediated multi-drug resistance in tumor cells [10–13]. It was also found that TPGS could effectively inhibit the growth of human lung carcinoma cells from in vitro cell culture and implanted in vivo . The superior anticancer efficacy of TPGS is associated with its increasing ability to induce apoptosis and not due to its increased cell uptake into cells [14–16]. Synergistic effects could be obtained by the use of combinations of vitamin E derivatives in the presence of other anticancer agents . Random copolymerization is known to provide new materials with properties intermediate between those of the parent homopolymers . This is a valuable method to fine-tune properties to the desired parameters. Therefore, in the present study, we synthesized a novel biodegradable poly(lactide-co-glycolide)-d-a-tocopheryl polyethylene glycol 1000 succinate (PLGA-TPGS) random copolymer in order to achieve high drug encapsulation efficiency, desired drug release profiles, good biocompatibility and improvement in drug permeability across cancer cell membranes, resulting in high cellular uptake and good cytotoxicity against human cervix carcinoma cells (HeLa) using docetaxel as a model anticancer drug due to its excellent therapeutic effects against a wide spectrum of cancers and its commercial success as the best seller among all the anticancer agents. D,L-lactide (3,6-dimethyl-1,4-dioxane-2,5-dione, C6H8O4) with a purity greater than 99% was purchased from Aldrich, Milwaukee, USA. They were recrystallized at least three times from ethyl acetate before reaction to remove the residual impurities in the monomer. d-α-tocopheryl polyethylene glycol 1000 succinate (TPGS, C33O5H54 (CH2CH2O)23) was from Sigma (St. Louis, MO, USA). Stannous octoate (Sn(OOCC7H15)2), glycolide (1,4-Dioxane-2,5-dione, C4H4O4) (purity >99%) and PLGA (50:50, MW 50,000) were also purchased from Sigma (St. Louis, MO, USA). Docetaxel powder of purity 99.8% was purchased from Shanghai Jinhe Bio-Technology Co. Ltd (Shanghai, China). Acetonitrile and methanol were purchased from EM Science (ChromAR, HPLC grade, Mallinckrodt Baker, USA). All other chemicals used were of the highest quality commercially available. Ultrahigh pure water produced by Boon Environmental Tech. Industry Co., Ltd. (Tianjin, China) was utilized throughout all experiments. Human cervix carcinoma HeLa cells were provided by American Type Culture Collection (ATCC, Rockville, MD). PLGA-TPGS random copolymers were synthesized by ring-opening bulk polymerization of lactide and glycolide monomer with TPGS in the presence of stannous octoate as catalyst. Briefly, weighted amounts of glycolide, lactide, TPGS and 0.5 wt% stannous octoate (in distilled toluene) were added in a reaction flask. The mixture was heated to 145°C and allowed to react for 16 h. Synthesis was carried out under an oxygen- and moisture-free environment. The resulting product was dissolved in DCM and then precipitated in excess cold methanol to remove unreacted monomers and TPGS. The final product was collected by filtration and dried under high vacuum at 45°C for 48 h.
FTIR spectrophotometer (Thermo Nicolet, Madison, WI, USA) was used to investigate the molecular structure of PLGA-TPGS copolymer. In brief, the samples for FTIR analysis were prepared by grinding 99% KBr with 1% random copolymer and then pressing the mixture into a transparent tablet. The TPGS content and number-averaged molecular weight of the copolymer were determined by 1H NMR in CDCl3 at 300 Hz (Bruker ACF300). The weight-averaged molecular weight and molecular weight distribution were determined by gel permeation chromatography (Waters GPC analysis system with RI-G1362A refractive index detector, Waters, Milford, USA) column was used. The mobile phase was THF delivered at a flow rate of 1 ml/min. The injection volume was 50 μl sample solution (0.1% w/v polymer in mobile phase). The calibration curve was established by using polystyrene standard sample (molecular weights: 5.51 × 104, 1.39 × 104, 2.97 × 103 and 162, respectively). Thermogravimetric analysis (TGA, TGA 2050 thermogravimetric analyzer, USA) was carried out to investigate the thermal properties of the copolymers. During the TGA analysis, about 5–15 mg of the random copolymer sample was heated from 30 to 600°C at a rate of 10°C/min. The docetaxel-loaded PLGA-TPGS nanoparticles were prepared by a modified solvent extraction/evaporation method . In brief, a given amount of docetaxel and 100 mg PLGA-TPGS copolymer were dissolved in 8 ml dichloromethane (DCM). The formed solution was poured into 120 ml 0.03% TPGS pure water solution under gentle stirring. The mixture was sonicated for 120 s at 25 W to form O/W single emulsion. The emulsion was then evaporated overnight to remove DCM. The particle suspension was centrifuged at 20,000 rpm for 15 min and then washed three times to remove the unloaded drug and surfactant. The resulted particles were resuspended in 10 ml water and freeze-dried for 2 days. In addition, the fluorescent coumarin-6–loaded nanoparticles were prepared in the same way, except 0.1% (w/v) coumarin-6 was encapsulated instead of docetaxel. The particle size and size distribution of the nanoparticles were measured by Dynamic Light Scattering (Zetasizer Nano ZS90, Malvern Instruments LTD., Malvern, UK). One milligram of particles was suspended in 3 ml of pure deionized water before measurement. The measurement was performed in triplicate. The nanoparticles were imaged by a field emission scanning electron microscopy (FESEM) system at an accelerating voltage of 5 kV. The particle surface was coated with platinum layer before being observed. The samples were prepared by diluting the nanoparticles suspension with pure deionized water. Zeta potential of the nanoparticles was measured by Laser Doppler Anemometry (LDA; Zetasizer Nano ZS90, Malvern Instruments LTD., Malvern, UK). The data were obtained with the average of three measurements. The docetaxel entrapped in the drug-loaded PLGA-TPGS nanoparticles was measured by HPLC (LC 1200, Agilent Technologies, Santa Clara, CA). A reverse-phase Inertsils C-18 column (150 × 4.6 mm, pore size 5 mm, GL science Inc, Tokyo, Japan) was used. Briefly, 5 mg nanoparticles were dissolved in 1 ml DCM. After DCM was evaporated in nitrogen atmosphere, the samples were extracted by 5 ml mobile phase (50/50 (v/v) acetonitrile/water solution). Twenty microliters of the clear solution was used for HPLC analysis. The flow rate of mobile phase was 1 ml/min. Retention time was controlled at 15 min. The column effluent was detected at 227 nm with a UV/VIS detector. The drug encapsulation efficiency was defined as the ratio between the amount of docetaxel entrapped in nanoparticles and that added in the process. 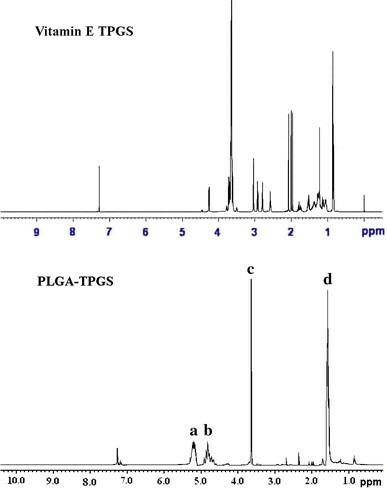 The physical status of docetaxel inside the drug-loaded PLGA-TPGS nanoparticles was investigated by differential scanning calorimetry (DSC 822e, Mettler Toledo, Greifensee, Switzerland). The samples were purged with dry nitrogen at a flow rate of 20 ml/min. The temperature was ramped at a rate of 10°C/min. In brief, 15 mg drug-loaded PLGA-TPGS nanoparticles were dispersed in 5 ml release medium (phosphate buffer solution of pH 7.4 containing 0.1% w/v Tween 80) to form a suspension. The suspension was transferred into a Regenerated Cellulose Dialysis Membrane (Spectra/Por 6, MWCO = 1000, Spectrum, Houston, TX, USA). Then, the closed bag was put into a centrifuge tube and immersed in 15 ml release medium. The tube was put in an orbital water bath shaking at 120 rpm at 37.0°C. Ten milliliters of solutions was periodically removed for HPLC analysis and replaced with fresh medium. The collected samples were extracted with 2 ml DCM and reconstituted in 5 ml mobile phase. The DCM was evaporated by nitrogen stream. The analysis procedure was the same as for the measurement of encapsulation efficiency. Human cervical adenocarcinoma cancer cell lines HeLa cells were cultured in Dubelco’s modified essential medium (DMEM) supplemented with 10% fetal bovine serum and antibiotics. The culture was maintained in incubator containing 5% CO2 at 37°C. The cells were incubated with 250 μg/ml coumarin-6–loaded nanoparticles at 37°C for 4 h, rinsed with cold PBS for three times and then fixed by methanol for 10 min. Cells were stained with DAPI for 15 min and washed three with PBS. Finally, cells were observed by confocal laser scanning microscope (CLSM, Olympus Fluoview FV-1000, Olympus Optical. Co., Ltd., Tokyo, Japan). The images of the cells were determined with differential interference contrast (DIC) channel, and the images of coumarin-6–loaded nanoparticles and the nuclei of the cells stained by DAPI were recorded with following channels: blue channel (DAPI) with excitation at 340 nm and green channel (coumarin-6) with excitation at 488 nm [18, 19]. HeLa cells were seeded in 96-well plates at the density of 5,000 viable cells per well and incubated 24 h to allow cell attachment. 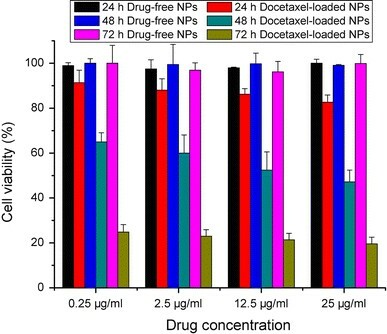 The cells were incubated with docetaxel-loaded PLGA-TPGS nanoparticle suspension at 0.025, 0.25, 2.5, 10 and 25 μg/ml docetaxel concentrations and drug-free PLGA-TPGS nanoparticle suspension with equivalent nanoparticle concentrations of 0.25, 2.5, 25, 100 and 250 μg/ml for 24, 48 and 72 h, respectively. At the determined time, the formulations were replaced with DMEM containing MTT (5 mg/ml), and cells were then incubated for additional 4 h. MTT was aspirated off, and DMSO was added to dissolve the formazan crystals. Absorbance was measured at 570 nm using a microplate reader (Bio-Rad Model 680, UK). Untreated cells were taken as control with 100% viability, and cells without the addition of MTT were used as blank to calibrate the spectrophotometer to zero absorbance. The data are expressed as mean ± SD. The significance of differences was assessed by Student’s t test and was considered significant when p = 0.05. The PLGA-TPGS random copolymer was synthesized in this research using the stannous octoate as catalyst. The reaction of synthesis is schematically described in Fig. 1. The hydroxyl end of TPGS served as initiator to selectively cleave acyl oxygen chain of lactide or glycolide. 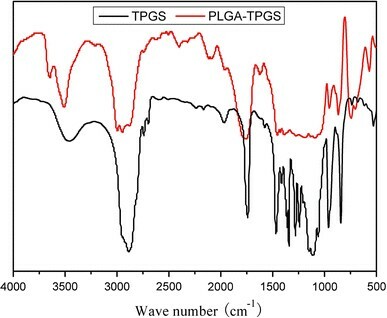 The FTIR spectra of the PLGA-TPGS random copolymer and TPGS were showed in Fig. 2. The carbonyl band of TPGS appears at 1,730 cm−1. For the synthesized random copolymer, the carbonyl band was shifted to 1,754 cm−1. Overlapping of the CH stretching band of PLA at 2,945 cm−1 and that of TPGS at 2,880 cm−1 was observed. In the PLGA-TPGS copolymer, the CH stretching band of TPGS was decreased. The absorption band at 3,400–3,650 cm−1 is attributed to the terminal hydroxyl group and that at 1,045–1,500 cm−1 is due to the C–O stretching . Figure 3 shows typical 1H NMR spectra of the PLGA-TPGS random copolymer and TPGS monomer. The signals at 5.2 (peak a) and 1.69 ppm (peak d) were assigned to the –CH protons and methyl protons –CH3 of PLA segment, respectively. The peak at 3.65 ppm (peak c) was assigned to the –CH2 protons of PEO part of TPGS . The peak at 4.82 was assigned to the –CH2 of PGA . The molecular weight of the PLGA-TPGS random copolymer was calculated using the ratio between the peak areas at 5.2 (peak a), 4.8 (peak b) and 3.65 (peak c). The number-averaged molecular weight of the PLGA-TPGS random copolymer was determined to be 21,747. The ratio of glycolide, lactide and TPGS molecular mass, which were integrated into the PLGA-TPGS random copolymers, is 50.61, 38.95 and 10.44%, respectively. GPC analysis further confirmed that the PLGA-TPGS random copolymer was synthesized by the ring-opening polymerization. Figure 4 shows that the peak for TPGS appeared at 28.23 min. Instead, the peak of the random copolymer shifted to 18.58 min. There was just one narrow peak for the random copolymer, and the TPGS peak could not be detected. The polydispersity of the copolymer molecular weight was narrow, which was around 1.30. The number-averaged molecular weight calculated from the GPC chromatograph was 21,944. It appeared that the molecular weight measured from GPC and NMR could confirm each other. Thermogravimetric analysis (TGA) was performed on the synthesized PLGA-TPGS random copolymer in order to investigate its thermal property. 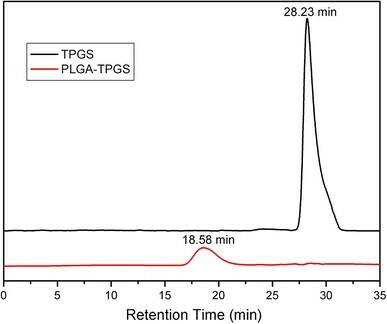 Figure 5 shows the typical thermal degradation profiles for TPGS monomer and PLGA-TPGS random copolymer. It was observed that the thermal degradation profile of PLGA-TPGS random copolymer showed two regions of weight loss, which were different from a single mass loss for the TPGS monomer. Each turning point marked the combustion of a new component in the random copolymers. The 200–315°C and 315–450°C combustion zones were attributed to PLGA and TPGS part of copolymer, respectively. 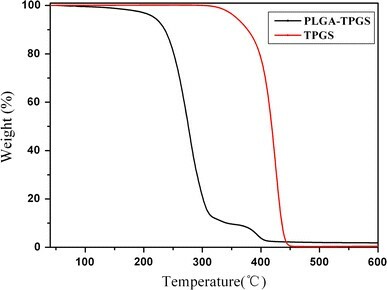 The TPGS composition of the PLGA-TPGS copolymer calculated from TGA was 10.71%, which could match very well with NMR result and also confirmed the synthesis of PLGA-TPGS random copolymer. Thus, TGA was a convenient means for evaluating the mass ratios of the PLGA-TPGS random copolymer. Liggins et al. also found that PLA-MPEG copolymers demonstrated a biphasic thermal degradation profile, and TGA was applicable as composition calculation for PEGylated copolymers. The size and size distribution of the docetaxel-loaded PLGA-TPGS nanoparticles prepared in this research are shown in Table 1. The particle size was found from 207.15 nm to 244.71 with size distribution of less than 0.4 polydispersity for samples without extra TPGS. Addition of TPGS in the process as emulsifier slightly increased the particle size, which agreed with the previous report . The mean particle size was found around 265.43 nm with size distribution of 0.36 polydispersity for samples with the addition of 0.03% TPGS and around 290.25 nm with size distribution of 0.48 polydispersity for samples with the addition of 0.06% TPGS. The coating effect of TPGS on the particle surface and the aggregation of the formed nanoparticles because of extra TPGS may account for the increases in nanoparticle size. Table 1 also shows the drug loading and surfactant effects on size and size distribution and the drug EE. The PLGA-TPGS nanoparticles prepared without the addition of emulsifier can result in a relative lower EE, which was found to be 48.35% for 10% drug loading and 58.87% for 2.5% drug loading. For the high drug loading of 10%, however, the EE of the docetaxel-loaded PLGA-TPGS nanoparticles can be improved by the addition of TPGS in the process as emulsifier. The drug EE increased significantly to near 100% for 10% drug loading when 0.03% TPGS was added as emulsifier and to 85.85% when 0.06% TPGS was added. Thus, too little emulsifier would not be enough to cover the interface and too much emulsifier would cause nanoparticle aggregation . It can be seen from Table 1 that 0.03% TPGS used as an emulsifier did improve the EE of the PLGA-TPGS nanoparticles from 48.35 to 99.31% for a high drug loading of 10%. Zeta potential determines the particle stability in dispersion. High absolute value of the zeta potential suggests high surface charge of the nanoparticles, which leads to strong repellent interactions among the nanoparticles in dispersion and thus high stability . As shown in Table 1, the absolute value of zeta potential for docetaxel-loaded PLGA-TPGS nanoparticles was found to be about 18.03 mV, which was slightly lower than that of nanoparticles fabricated from PLGA, indicating a slightly lower stability for docetaxel-loaded PLGA-TPGS nanoparticles. The negative surface charge of PLGA-TPGS nanoparticles may be attributed to the presence of ionized carboxyl groups of PLA and PGA segments on the nanoparticles surface. Figure 6 shows the FESEM images of the docetaxel-loaded PLGA and PLGA-TPGS nanoparticles. Both PLGA and PLGA-TPGS nanoparticles were spherical in shape and appear smooth within the FESEM resolution level. Their size was observed to be around 250 nm, which further confirmed the results of particle size determined by DLS. The physical state of docetaxel in the nanoparticles that could influence the in vitro and in vivo release of the drug from the systems was investigated by differential scanning calorimetry (DSC). 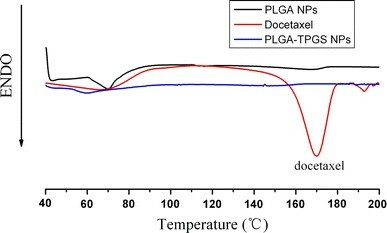 Figure 7 shows the DSC thermograms of pure docetaxel powder, docetaxel-loaded PLGA-TPGS nanoparticles and docetaxel-loaded PLGA nanoparticles. The melting endothermic peak of pure docetaxel appeared at 173°C. However, no melting peak was detected for both nanoparticle formulations. Thus, it can be concluded that docetaxel inside the nanoparticles was either in an amorphous, disordered crystalline phase or in the solid solution state. As shown by Fig. 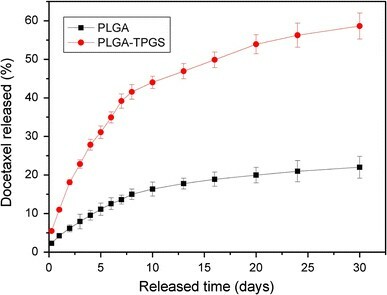 8, the in vitro drug release profiles of the docetaxel-loaded PLGA-TPGS nanoparticles and PLGA nanoparticles showed biphasic release pattern with an initial burst followed by a sustained release. The drug release from the PLGA-TPGS nanoparticles was found to be 22.83 and 58.61% of the encapsulated drug in the first three days and after 28 days, respectively, which was much faster than the docetaxel-loaded PLGA nanoparticles in the same periods. The faster drug release of the PLGA-TPGS nanoparticles may be caused by the lower molecular weight and the higher hydrophilicity of PLGA-TPGS random copolymer in comparison with the PLGA nanoparticles. This is also another advantage of the PLGA-TPGS nanoparticles versus the traditional PLGA nanoparticles, which were found to release the drug too slowly to meet the therapeutic needs. Confocal laser scanning microscopy (CLSM) images (Fig. 9) showed that the fluorescence of the coumarin-6–loaded PLGA-TPGS nanoparticles (green) was closely located around the nuclei (blue, stained by DAPI), which indicated that the coumarin-6–loaded PLGA-TPGS nanoparticles had been internalized into the cells. The in vitro cytotoxicity of drug-free PLGA-TPGS nanoparticles and docetaxel-loaded PLGA-TPGS nanoparticles in HeLa cell line was assessed by the MTT assay. The range of concentrations of docetaxel (0.25–25 μg/ml) corresponds to plasma levels of the drug achievable in humans . From Fig. 10, we can draw some general conclusions: (1) no obvious cytotoxicity was observed for the drug-free nanoparticles at various nanoparticle concentrations. The synthesized PLGA-TPGS copolymer was considered biocompatible since the drug-free PLGA-TPGS nanoparticles show little decrease in cellular viability for Hela cells; (2) the docetaxel-loaded PLGA-TPGS nanoparticles showed significant cytotoxicity against Hela cells. Hela cell viability decreased from 91.37% for drug-loaded PLGA-TPGS nanoparticles containing 0.25 μg/ml docetaxel to 82.65% for drug-loaded PLGA-TPGS nanoparticles containing 25 μg/ml docetaxel after 24-h cell culture (8.62% more effective in vitro therapeutic effect, p < 0.05). After 48-h cell culture, the cell viability decreased from 65% for drug-loaded PLGA-TPGS nanoparticles containing 0.25 μg/ml docetaxel to 47.21% for drug-loaded PLGA-TPGS nanoparticles containing 25 μg/ml docetaxel (17.79% more effective in vitro therapeutic effect, p < 0.05). Other concentrations of drug-loaded PLGA-TPGS nanoparticles showed similar in vitro therapeutic effects; (3) the cellular viability decreased with the incubation period in all cases. For example, Hela cell viability decreased from 88% for drug-loaded PLGA-TPGS nanoparticles containing 2.5 μg/ml docetaxel after 24-h cell culture to 60% after 48-h cell culture (28% more effective in vitro therapeutic effect, p < 0.01) and achieved 22.98% cell viability after 72-h cell culture (38.02% more effective in vitro therapeutic effect than that of 48-h treatment, p < 0.01). With the increase in docetaxel concentration, more effective in vitro therapeutic effects could be observed. The strongest in vitro therapeutic effect could be found in 25 μg/ml docetaxel concentration, which achieved 19.61% cell viability after 72-h cell culture, because the nanoparticles released the most amounts of drugs and the degradation of PLGA-TPGS random copolymer may release the most amounts of TPGS components that have synergistic anticancer activity in the presence of anticancer agent [14–16] after 72-h incubation. For the first time, the poly(lactide-co-glycolide)-d-a-tocopheryl polyethylene glycol 1000 succinate (PLGA-TPGS) random copolymers were successfully synthesized as nanoparticle carrier of small molecular anticancer drugs with docetaxel as a model drug. The docetaxel-loaded PLGA-TPGS nanoparticles were prepared by a modified solvent extraction/evaporation method. The size of such nanoparticles was found to be around 250 nm. The docetaxel-loaded PLGA-TPGS nanoparticles could achieve much faster drug release in comparison with PLGA nanoparticles. In vitro cellular uptakes of such nanoparticles were investigated by CLSM, demonstrating the fluorescence PLGA-TPGS nanoparticles could be internalized by human cervix carcinoma cells (HeLa). The results showed that PLGA-TPGS–based nanoparticles were biocompatible, and the docetaxel-loaded PLGA-TPGS nanoparticles had significant cytotoxicity against Hela cells. The cytotoxicity against HeLa cells for PLGA-TPGS nanoparticles was in time- and concentration-dependent manner. In conclusion, PLGA-TPGS random copolymer could be acted as a novel and potential biocompatible polymeric matrix material applicable to nanoparticle-based drug delivery system for cancer chemotherapy. Yuandong Ma and Yi Zheng contributed equally to this work. The authors are grateful for financial support from the National Natural Science Foundation of China (Grant No 30900291), China Postdoctoral Science Foundation (No. 20090450030), Shenzhen Bureau of Science, Technology & Information (No. JC200903180531A) and Shenzhen Nanshan Science and Technology Program (KJ02S0210900000109). The author owes an especial debt of gratitude to Prof. Feng Si-shen for his advice and assistance.